apply/Submit online applications through KPSC web portal @http://kpsc.kar.nic.in/. Online registration starts from 20-03-2019 to 31-03-2019 by 11.45 PM. Last date to deposit application fee is 01-04-2019. The Commission will organize written test to select candidates for KPSC FDA, SDA Vacancies Recruitment 2019. 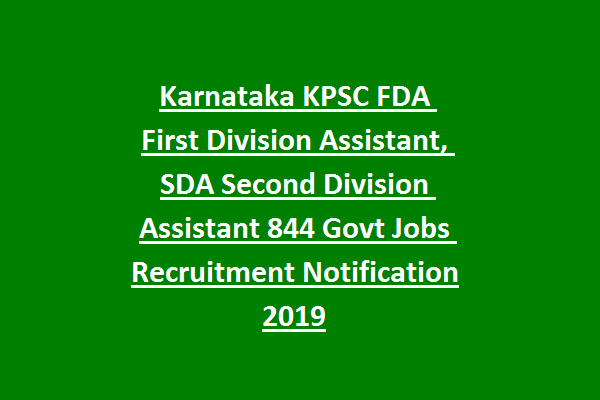 Available Vacancies, Qualifications, Age limits, Pay Scale, Previous question papers, exam syllabus, Mode of Examination and other required information of Karnataka Public Service Commission KPSC FDA, SDA Recruitment 2019 Notification are mentioned below. Online application process starts from: 11-02-2019. Online application Process closing date: 20-03-2019 (11.45 PM). Last date to deposit application fee: 31-03-2019. There are total 844 vacancies available in KPSC. 1. First Division Assistant FDA : 269 posts. 2. Second Division Assistant SDA : 575 posts. First Division Assistant and Senior Assistants (KFCSC): Candidate should complete any Bachelor’s Degree or its equivalent course from recognized University. Second Division Assistant and Junior Assistants (KFCSC): PUC from Karnataka Pre University/ Diploma or its equivalent course such as ITI from recognized Institute/ University. Applicants should have a minimum age limit of 18 years and upper age limit for general category is 35 years, Cat- 2A, 2B, 3A, 3B is 38 years and 40 years for SC, ST. 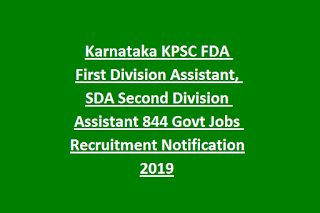 Monthly pay scale of KPSC FDA and SA (KFCSC) Posts is Rs. 14,550- Rs. 26700/-. Monthly pay scale of KPSC SDA and JA (KFSCS) Posts is Rs. 11,600- Rs. 21000/-. KPSC will organize written test to select candidates for the current vacancies. Written Examination will consist of 3 papers. Paper I is Descriptive Type test for 150 marks and time duration is 90 minutes. Paper II-General English or General Kannada: Covers the topics English/ Kannada Grammar, Vocabulary, Spellings, Synonyms. Paper III- General Knowledge: Cover the topics related to Constitution of India, Indian History and culture, Economic Geology of India. Candidates are required to visit KPSC Official advertisement for syllabus and mode of examination. Paper 1 is purely Descriptive Type only. Interested candidates can apply online applications through the KPSC official website http://kpsc.kar.nic.in/. Read the Notification to know eligible criteria and follow the instructions to fill online application form. Last date to submit online applications is 12-03-2019 by 11.45 PM. Last date to deposit application fee is 13-03-2019 only through challan at post office or online payment.